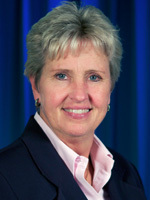 Mary Kay Thatcher has worked as a lobbyist for the American Farm Bureau Federation for 28 years. She currently serves as Senior Director of Congressional Relations where she lobbies primarily on issues covering farm programs, crop insurance, conservation, credit and Big Data. Mary Kay served in the “first” Bush Administration as a political appointee as the director of congressional and public affairs of the Farm Credit Administration. In that capacity, she was responsible for the policy direction and management of the agency’s congressional and public affairs activities. Prior to joining AFBF in 1982, Thatcher served as a legislative assistant for agriculture and trade to Senator Roger Jepsen of Iowa. She is a graduate of Iowa State University where she earned degrees in animal science and agricultural economics. Mary Kay is a fifth generation Iowa farmer. She grew up on a 500-acre Iowa beef, hay and corn farm. She now manages a farm in Iowa producing corn and soybeans, as well as a cow/calf operation.